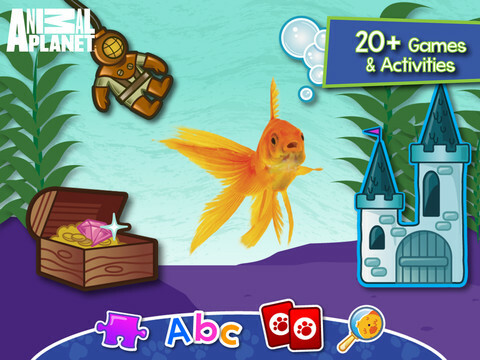 Animal Planet Hide & Seek Pets App Review – Pet-tastic Fun! I’m a stay-at-home mom and there are some days I just run out of things to do with the kids. The museum is a long ride away, the playground works when the weather’s nice, and there’s only so many Pinterest craft projects I can do in a week. If I’m at a loss, I pull out the pet store card – the kids go nuts and no one notices their noise over the symphony of birds squawking or dogs barking. Inevitably the kids have a million and one questions about the pets we see, and instead of Googling I can now sit down and play Animal Planet Hide & Seek with my kids. Developed by Cupcake Digital and Discovery Communications, this app is brimming with legitimate educational content that’s more fun to play with than a litter of puppies. 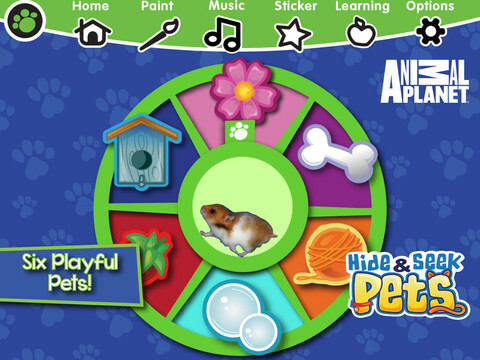 A “spinning” wheel of different pet accessories (with a photorealistic hamster at the helm) randomly chooses which pet players can explore. 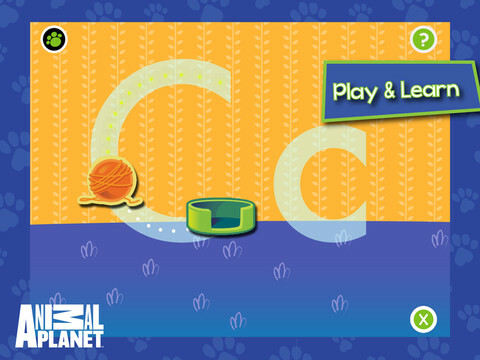 Each pet screen offers fun facts, memory and letter recognition games, and a puzzle of the animal. Skip the animals and try open-ended play with features like coloring pages or sticker pages. Common Core State Standards (CCSS) are the foundation for all of the educational content in this app so you can rest assured that that the learning portions will actually prepare your preschooler for kindergarten. My kids would have a house full of ferrets or lizards or whatever if I would let them, but I don’t because one of my aliases is The Meanest Mom Ev-ER. So I let them have at Hide & Seek Pets to try and appease their pet-loving ways and they actually had more fun with the app than they would shoveling rodent poop out of wood shavings. My 5-year-old son loved the facts that popped up as he’s quite science-minded. My 3-year-old daughter loves anything art so we now have a gallery of pink kittens saved in our iPad gallery. Cupcake Digital has taken the CCSS and turned it into a slew of fun apps (featuring Wubbzy and the Fraggles) that make preparing for gradeschool a breeze and this app is now in great company. The download price of $3.99 is pennies compared to the amount of educational content it offers. Best part? It’s hypoallergenic and you don’t have to change the wood shavings after you’re done playing. – None; this app got our tail wagging! Now you can say yes when the kids ask for a hamster!